Pictured from left to right: Chris Garrell, National Steel Bridge Alliance; Ed Wasserman, Modjeski and Masters (former Chairman, AASHTO T-14 Technical Committee for Structural Steel Design); Ronnie Medlock, High Steel Structures (Chairman of the Steel Bridge Task Force Oversight Council); and Tom Macioce, Pennsylvania Department of Transportation (current Chairman, AASHTO T-14 Technical Committee for Structural Steel Design). Washington, D.C. — The Steel Bridge Task Force of the Steel Market Development Institute (SMDI), a business unit of the American Iron and Steel Institute (AISI); the National Steel Bridge Alliance (NSBA); and the American Association of State and Highway Transportation Officials (AASHTO) T-14 Technical Committee for Structural Steel Design named Ed Wasserman, senior engineer of bridge design and engineering at Modjeski and Masters, as the recipient of the 2019 Richard S. Fountain Award. Named for the founder of the Steel Bridge Task Force, the Richard S. Fountain Award recognizes leadership in steel bridge research and outstanding efforts to advance AASHTO specifications. 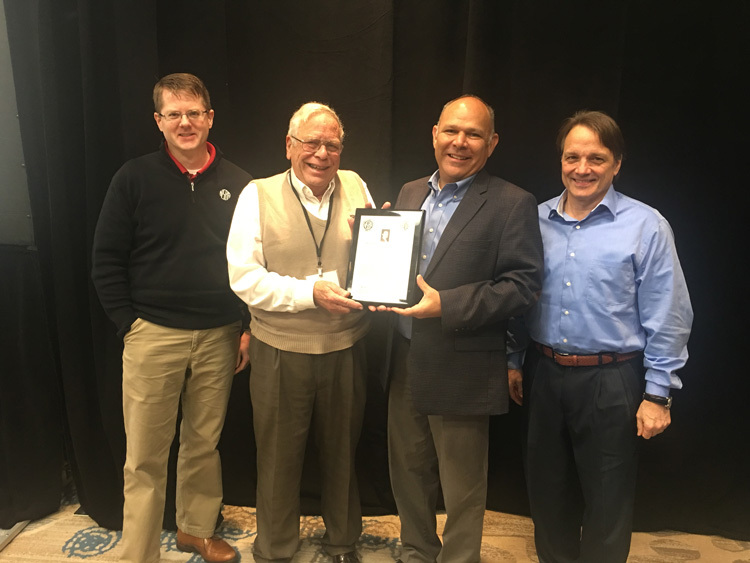 Wasserman received the award at the meeting of the Steel Bridge Task Force on January 24, 2019 in Orlando, Florida. The award was presented by Ronnie Medlock of High Steel Structures, who is also chairman of the Steel Bridge Task Force Oversight Council; Tom Macioce of the Pennsylvania Department of Transportation, who is also chairman of the AASHTO T-14 Committee; and Chris Garrell of the NSBA. Wills noted that the Tennessee Department of Transportation built the first HPS bridge in 1998. High-Performance Steels were developed by the American Iron and Steel Institute; Carderock Division, Naval Surface Warfare Center; and the Federal Highway Administration. They are more cost-effective, higher in strength, lighter in weight, and have greater atmospheric resistance than conventional steels, along with enhanced fracture toughness. Before joining Modjeski and Masters, Wasserman was director of the Structures Division at the Tennessee Department of Transportation. He served as chairman of the AASHTO T-14 Committee for 25 years and was also chairman of the AASHTO T-10 Technical Committee for Prestressed Concrete Design (later subsumed into the Technical Committee for Concrete Design). He has authored or co-authored 16 papers on various bridge design topics. One of his co-authored publications is “Integral Abutments for Steel Bridges,” which synthesized the state-of-the-art design and construction practice for integral abutments that was instrumental in extending the service life of steel bridges. Over the course of his career, the Structures Division he led received 34 design excellence awards. Among personal awards received are those from the Lincoln Arc Welding Foundation and the American Institute of Steel Construction. SMDI’s Steel Bridge Task Force was formed more than 40 years ago to coordinate research that establishes safe, cost-effective steel bridges and to implement these developments into steel bridge design codes, specifically the AASHTO design codes. Its members include steel producers, steel organizations, steel bridge fabricators, bridge owners, the AASHTO T-14 Committee, university faculty, consultants and representatives from the Federal Highway Administration.